In this experiment, students will learn the basic concepts of PCR by observing the increased accumulation of product with increasing number of cycles. The experiment is divided into three modules — PCR Reaction, Separation of PCR Reactions by Electrophoresis, and Size Determination of PCR Amplified DNA Fragment. The template DNA to be amplified is a linear molecule from the E. coli bacteriophage lambda. It contains approximately 49,000 base pairs and has five recognition sites for Eco RI, and seven for Hind III. 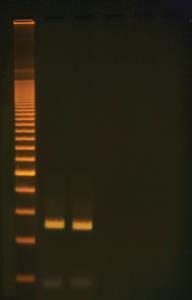 This experiment contains reagents to perform PCR reactions for 10 setups. Contents include: PCR Dryzyme® reaction pellets™, Instastain® Ethidium Bromide DNA stain, UltraSpec-Agarose™, Electrophoresis Buffer (50x), 10x Gel Loading Solution, InstaStain® Ethidium Bromide, Microcentrifuge Tubes (0.5 ml), PCR tubes (0.2 ml), Wax beads (for waterbath option or thermal cyclers without heated lid), and Coupon for a freezer pack with reagents for two primers, a 200 base pair ladder, and Lambda DNA template for amplification (ship and store at -20°C). Requires, but does not include include a horizontal gel electrophoresis apparatus, DC power supply, thermal cycler, balance, microcentrifuge, waterbath, UV transilluminator or white light, microwave, automatic pipets, distilled or deionized water, and isopropynol.